Historical synagogue in the outback city of Broken Hill defaced with Nazi and Islamic symbols. 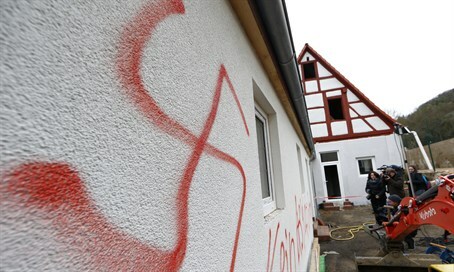 An historical synagogue in Australia has been defaced with Nazi and Islamic symbols, the J-Wire Jewish news website reported on Tuesday. According to the report, the coordinator of the historical synagogue in the outback city of Broken Hill arrived at work on Monday to prepare for a visit by tourists and found the vandalism at the front of the building. “Although there is no Jewish presence in the city these days, I grew up with Jews and my family worked with them. They were Broken Hillers and a strong part of our community. We are dismayed by this scurrilous attack on the building on the very day of its 105th anniversary,” she added. The Broken Hill Synagogue was established in 1910 to meet the spiritual needs of a small but vibrant Jewish community serving the booming mining town. When the mining boom slowed down to a trickle of its former self, most of the Jewish community left, noted J-Wire. Broken Hill is located in far west New South Wales and lies 400 kilometers from the Jewish community of Adelaide, 1500 kilometers from the Jewish community of Sydney and 850 kilometers from Melbourne. The vandalism comes days after a video uploaded to Facebook by Australian Jewish News showed a man screaming at a group of Hassidic Jewish men outside the Adass Synagogue in Melbourne, Australia, then attacking one of them. The motives for that attack are unclear, as the man in the video appeared to be under the influence of drugs or alcohol. Last year, a group of drunken anti-Semites terrorized a school bus filled with Jewish students in Australia, shouting Nazi slogans and threatening to murder everyone on board. A teenager who took part in that attack was later ordered by a court to attend a Shabbat dinner and visit Sydney's Jewish Museum. “All acts of racism are strongly condemned, and how much more so in a city which was built on its multicultural ethos, with Jews having a long and proud history in Broken Hill until recently,” added Alhadeff.